The Future is Bright for our Graduates! 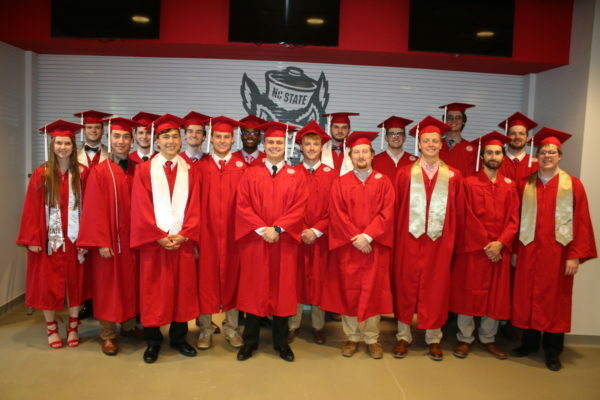 On May 12th, 22 PSE graduates entered Reynolds Coliseum eager and ready to walk across the stage to receive their diploma. It was the day they all dreamed about since they stepped onto the campus of NC State and it was finally a reality. There was immense joy and happiness throughout the entire stadium as every name was read, a feeling of pride and accomplishment soared through the crowd. With so many accomplishments to be celebrated , a few weeks prior, all of the students’ friends and family were invited to join the department’s faculty as they gathered for the Senior Banquet generously sponsored by Georgia Pacific. The unbridled joy seemed to carry through the whole ceremony as the graduates reminisced on their fond and precious memories over the last four years. 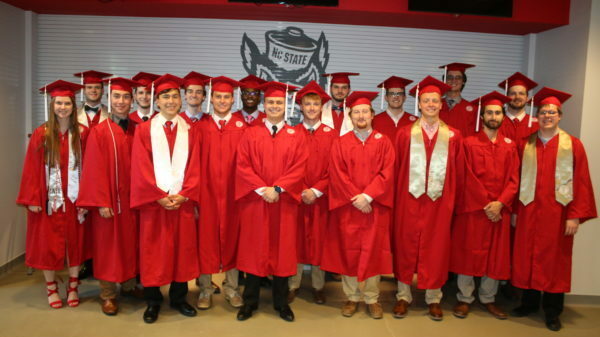 Hard work, sleepless nights, Senior Design Projects and the infamous PSE 472 – Papermaking class, to mention just a few, however, overwhelmingly, the friendships that developed through all the challenges is what stuck out more than anything else. You can’t go through 4 years of trial and error without support, and strangers become close friends as everyone strived to excel in the daily grind of this course work. It was clear that through it all, this class became a family and when one has to say goodbye it is heart wrenching. Alex May, a paper science and engineering and chemical engineering dual major, and voted Most Congenial Senior, by his classmates was quoted as saying “I have very deeply enjoyed working alongside and studying with each one of you. It has been a great opportunity and honor to learn from both my peers and my professors.” The classic “goodbye” turned into “see you soon” as each of them left with their families to continue the celebration of the exciting accomplishment. The opportunities are endless for graduates once they receive that golden degree. Companies that have hired these promising leaders include: ABB, Andritz, Clearwater Paper, Dow Chemical, ExxonMobil, First Quality, Graphic Packaging, International Paper, PCA, Twin Rivers Paper and WestRock. Some will be returning to familiar areas, as they have worked there prior. Others will be moving to entirely new states, like Orange, TX, or Kalamazoo MI. No matter the location, the anticipation of the real world is inspiring and the students cannot wait for it begin!